My latest PopMatters article is now live: Playing Dark Souls: Desperate Acts and Our Shared Humanity. 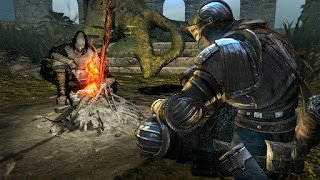 I almost called this article "Why Playing Dark Souls is Like Chopping Your Own Arm Off." I try to keep an inspirational tone throughout the piece, which I really do feel while playing the game. I also feel an immense amount of frustration. Most of the time my frustration stems from my own failings than the game system itself, and more importantly, how little the game respects my time. Like its predecessor, Dark Souls lacks a pause feature. OK, I get it. I need to fully commit to playing, I cannot go in half-hearted. I respect that philosophically. In fact, that plays right into the sensations evoked by Danny Boyle's take on Ralston's experience. Even the way I learn to defeat minions and bosses on the way to the next bonfire demands I do it all at once lest I forget. Unfortunately, I cannot feet Dark Souls easily into my normal life. I cannot always commit to hour-long play sessions, particularly free of interruption. I might get a phone call, or have get a call from by boss, and have to frantically find a place to rest while spending every minute outside the game trying to remember the dance maneuvers that will save my life when I go back in. I am sad to admit this, but I do not think Dark Souls is a game I will finish. That being said, I welcome your pep talks. Now on a slight tangent. I realize 127 Hours came out awhile ago, but I found the film immensely compelling. Boyle gorgeously lavishes our human capacity to overcome challenges and even our own mistakes. I would almost call it a "feel good" movie even though it is about a man who chops his own arm off. However, there are darker tales of our universal humanity. For example, Into Thin Air chronicles author Jon Krakauer's trip up Mt. Everest on which eight people lost their lives in a single night. I implore you: read this book. It will keep you thinking well after the final pages have turned. Whereas Boyle shows the human capacity to overcome great obstacles, Krakaur shows how humans can also succumb to their own egos, frailties, selfish whims, and ignorance when faced with these same obstacles. The book frighten you with its critique of mistakes any of us could make. Indeed, we all make mistakes all the time, and in extreme circumstances, this mistakes are revealed to be monstrous and grotesque. I love Dark Souls for the universal humanity it depicts on the apex of tenacity, but I also want to clime that mountain and find only human remains, the bones of all the fools that have come before. Unlike Demon's Souls, Dark Souls does have a pause feature. Just open the menu and Quit Game. When you reload, you'll be at the same place, and the enemies won't have respawned. I just think that should be said explicitly in the game. Gustavo - I believe Demon's Souls worked in exactly the same way. I do feel my skill level increasing more palpably than most games. As for pause feature, I had no idea. Although it's still not as easy as I would like.